Connor was talking about the Battle of Gettysburg, which took place over three days in July 1883 and is considered to be the bloodiest battle of the U.S. Civil War. “At whatever point the battle raged, the sons of the Pine Tree State were in the melee,” Gov. Connor, himself a Civil War veteran from the 7th Maine Volunteer Infantry Regiment, said. Connor was not at Gettysburg, but more than 4,000 other Maine soldiers were. Huntington, who was born in Augusta and attended Bowdoin College, said his interest in the Civil War began when he moved to Washington D.C. in 1985 and drove past the site of the Manassas Civil War battle, fought in July 1861 and considered to be the first major battle of the war. By the time he moved to Pennsylvania a few years later, Huntington said he was hooked on Civil War history and becoming more interested in the Maine connection. For many Civil War history buffs, the Maine star of Gettysburg is Joshua Chamberlain, fellow Bowdoin alumni. Chamberlain, who went on to become governor of Maine and later president of Bowdoin College, is among the more famous Gettysburg battle commanders, due in no small part to the book “Killer Angels,” by Michael Shaara, and the movie “Gettysburg” that it inspired. The movie, in particular, focused on Chamberlain and his 20th Maine regiment’s stand at Little Round Top, where they reportedly pushed back multiple Confederate charges, protecting the Union Army’s flank. The 20th Maine Volunteer Infantry Regiment was formed in 1862 with more than 1,600 volunteers mostly from central and southern Maine. 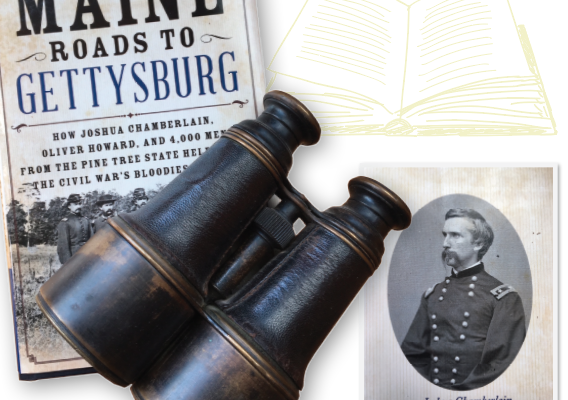 Through extensive archival research, Huntington tells the story of lesser-known Maine soldiers at Gettysburg and their important contributions to the Union’s victory there. Much of Huntington’s research came from letters written home by the Maine soldiers. Often, in reading one written account of Gettysburg or a letter from a soldier, Huntington would see references to men or places he’d read in other accounts, which he said gave real life to the people and experiences. Subsequent letters from the same young man to his sister described seeing Washington, D.C., being at the Battle of Fredericksburg and more mundane information about waiting to get his pay. Huntington also read letters from Hiram Berry who served as mayor of Rockland in the mid-1800s before he signed up to fight for the Union in 1861, despite having no previous military experience. Turns out, according to Huntington, Berry showed, showed a keen sense for battlefield command and was promoted to brigadier general for what was described as gallant service in the Battle of Manassas. Those are the kinds of stories Huntington loves to find. Following the final battle at Gettysburg, Huntington said the Union troops were in such a rush to chase down the retreating Confederate Army that they left behind crucial gear and equipment including warm clothing and food. Military bureaucracy further delayed the men getting their crucial gear, Huntington said. More than 150 years after the Battle of Gettysburg, Huntington said it — and the entire Civil War — still fascinates people deeply. Time, he said, has not tempered the passions that ignited the war.